Up to now I could only target people living in San Diego and that was it. There were a few official cities in the San Diego area like Poway, that are their own city. But the Beverly Hills of San Diego, La Jolla, was dumped in with Barrio Logan, and San Ysidro, which are not exactly well..uhmm….not exactly the same demographics, and definitely not the same location. 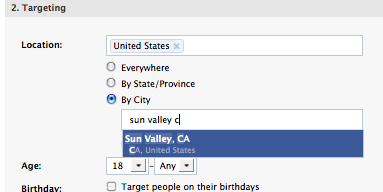 Today facebook came out with vastly more cities. If you are doing local it allows for vastly more targeting. Initially I believe this will decrease a bit of facebook income. The reason is that if you are marketing say for a local car wash that services a certain part of town, before this you would have had to target the whole town. This was a bit inefficient. But when I got it right, I could often turn it right side up anyways. Now local marketers will be able to be much more efficient. They will not be showing impressions to users who are 10 miles across town and unlikely to use that local business. Overall I expect this to make the hot local areas like say Miami Beach, or Manhattan more expensive, but for local campaigns in these areas I expect to spend less to reach my converting target market. 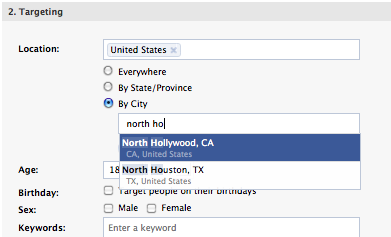 Facebook has been experimenting with this for a while, but just rolled out a whole mess of cities. I predict there are probably a good 1,000 new cities added today, but I don’t know for sure. Previously in San Diego if you wanted to target La Jolla, (where my office is), or the part of town next door, Pacific Beach, both of which are neighborhoods but not cities, then you had to market to all of San Diego. Today it became possible to go after the specific neighborhoods. It also used to be that you could only target Los Angles, which is massive, and now you can target neighborhood in L.A., like my home town Sun Valley (the auto wrecking capital of the world), and North Hollywood the neighborhood next door. This option will take a while to become valuable. 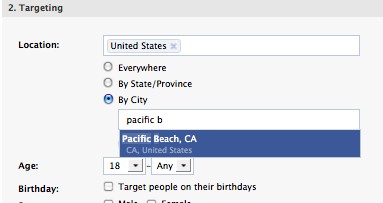 For example when I filled out my Facebook profile, La Jolla was not an option for me, only San Diego. It literally could take years for the majority of people to switch their profile to their local neighborhood instead of their greater city. Until then I will be running ads both to the neighborhood, which will be more efficient, but smaller campaigns, and to the cities at large to generate larger volume. That is great news for local marketers that are already making good money on their campaigns. I hadn’t tried any local but a frend ofine does want me to do some campaigns for his wedding photography biz very soon. I highly recommend you give it a shot with him. Depending on the city, it could be wide open, and have a very good ROI. Would people really be willing to choose such a specific location when indicating where they live? Seems safer to say which city your from than to say which neighbourhood you’re from. Facebook is an excellent place for advertising. Although there is a lot of on there, so many people are exposed to it that the audience is tremendous! I love that facebook is finally narrowing it down. I can finally say I live in Cardiff-by-the-Sea and they will pick that (awesome) neighborhood up. And that must make the ads more significant to the users. I wouldn’t want to come up to La Jolla from Coronado if I wanted an adjustment.